East-West Brothers Garage: Editorial: Is There A Way to Prevent Child and Pet Deaths in Overheating Cars? 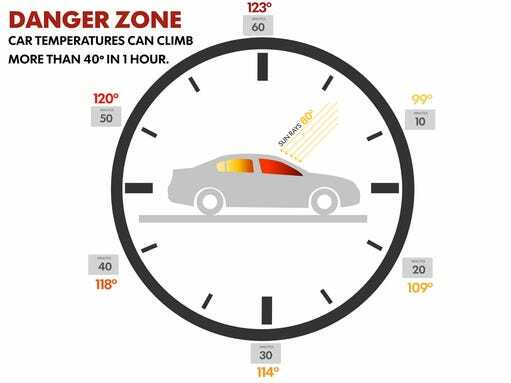 The easiest way to go about this is for the car to automatically monitor the internal temperature of the car, and to start the engine and air conditioning if the cabin temperature reaches a dangerous level for occupants. While effective, one major down side I could see for this system is it being a waste of gasoline and environmentalists would have a hissy fit for having a car throw more exhaust fumes into the atmosphere when it is not even in motion. Another way to go about preventing an overheating cabin would be to use the same concept as before, but add weight sensors to the seats so that the car does not start the air conditioning if there are no occupants. Unfortunately, while this would work for infants and toddlers that can be strapped to the seat in an infant car seat, pets and older children that have a tendency to move around would easily circumvent the weights. want to see if what sort of ideas other people have. Obviously, being a responsible parent and pet owner is always going to be the first line of defense. Unfortunately, it seems like people are becoming more irresponsible parents and pet owners. When the human element fails, what do you think the car do to prevent the death of a child or pet in a hot car? Readers, I want to hear what you think. Leave your comments below and tell me how you think a car should prevent the cabin from overheating when the parent or pet owner fails.